For many years, I skipped the stuffing. I thought I didn’t like it, and so I loaded my plate with mostly everything else–a bit of turkey, both colors of spuds, something green, and a dollop of cranberry sauce. As family Thanksgivings morphed into “orphan” Thanksgivings or Friendsgivings, I boldly ventured into stuffing-landia after witnessing my friends prepare the dish with chunks of French bread and Italian sausage and sage from the garden. I started to get it. Local food-writer and ideas guy Allan Parr has taken America’s affinity for stuffing and run with the crazy idea that it should be an option on days other than the third Thursday in November. There are lots of people on the sidelines cheering him on. After many years of hosting his own Friendsgiving celebration, one to which Jim-the-guy-who-makes-the-amazing-stuffing-was always invited, Parr had a lightbulb over the head moment. Friend Jim’s dish was always the talk of the party, there were never any leftovers, and people were always asking for the recipe. Follow Parr’s creative process one tryptophan-hungover morning: think of a word that rhymes with stuffin’ (yes, that would be muffin), bake up loads of the yummy stuff, package it, and make dreams–to have Thanksgiving in July or February–come true. 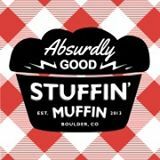 Fast forward to the summer of 2013, and Absurdly Good Stuffin’ Muffins are flying off the table at the Boulder, Longmont, and Golden farmer’s markets. In my humble opinion, there are two very good reasons for this. The first–which we’ve already touched on–is that, for many Americans, Thanksgiving and belly-happiness are inextricably linked. Good stuffing makes memories, ones usually only associated with this particular time of year. Just ask Nancy, a Boulder farmer’s market patron, who simultaneously berated and heaped praise on Parr for his addictive creation. “You are so bad. This is so bad! You don’t understand, I love stuffing. I always go back for seconds. I get up at midnight and sneak more!” After purchasing a muffin, she skulked away, head down, inhaling the aroma of Italian country goodness. Which leads me to reason #2 that these puppies are for real: they taste absurdly good. Like I said, I was never a huge stuffing fan, but I am a huge food fan, so when summoned to taste test this interesting new product, I did not hesitate. My first thought was “Wow, served atop a handful of fresh salad greens, this would make a lovely meal.” I tried the Classic, Jim’s original recipe (there are currently three flavors, a fourth to debut soon). This heavenly creation contains some of God’s finest ingredients: pancetta, pine nuts, Boulder sausage, veggies, rustic bread, Romano cheese and sage. Bellisima. 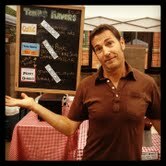 At the farmer’s market the other night, I sampled the other two flavors–the “Norman Rockwell” (named after the painter’s iconic “The Thanksgiving Picture”) which is loaded with turkey breast, cranberries, pecans (roasted in butter and cinnamon), plus veggies, bread, cheese and spices; and the “Peppy Diablo,” an incredibly tasty gluten-free and vegetarian muffin made with honey cornbread, green chiles, mango, hominy, cotija cheese, and roasted pepitas. Sabrosa. Twice a week, Parr and his staff hole up in a commercial kitchen for all of the working day and chop, slice, dice, roast, and bake everything that goes into the muffins. 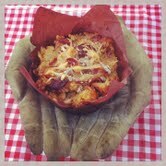 The cornbread in the “Peppy Diablo”? Baked fresh. The pecans in the “Normal Rockwell” and pine nuts in the “Classic”? Roasted by hand. The final hand-crafted product is a true labor of love, its story made even sweeter by the fact that its creator really just wants you to have a wonderful time enjoying it on a hike, at the market, or in the comfort of your own dining room. We live in a time of constant invention. Some ideas are new and never-seen-before, while others grab an old idea and refine and redefine it. Thankfully, the food world abounds with creative improvement right now. All sorts of gastronomically-minded folk are taking back old, ease-at-the-expense-of-taste concepts (ie. StoveTop Stuffing) and breathing new life into them with fresh ingredients and fun ideas. 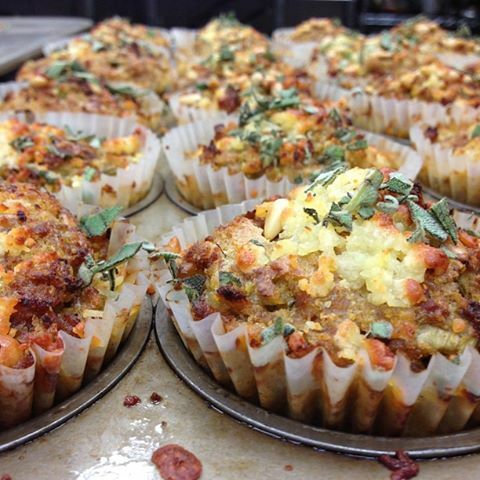 Absurdly Good Stuffin’ Muffins represent just that: a new—and absurdly tasty—twist on an good old idea. Betsy, thank you for a beautiful read. I’m also cheering Allan and his crew on! Weehoo! Thanks, Betsy, all of us at Absurdly Good enjoyed this article, it was absurdly well written, as always. And by “us” I mean, Jim Clawson (the guy who created our original recipe, and several other recipes since then), Ariana Ross (another superb EDB writer, as you know) and Irv Stern (a long-time friend, and stuffing lover) all of whom are part-owners of the company, and without whom there would be no Farmer’s Markets or Absurd Goodness! Previous Previous post: Boulder’s Number One Dining Spot on a Wednesday Night?